The seat of Howard County, Ellicott City, Maryland is an incorporated city full of history and beautiful neighborhoods. With easy access to cities like Columbia, Baltimore, and Washington, DC, Ellicott City is the perfect place for commuters to live and raise their family. What better way to enjoy your weekends off than with a beautiful custom pool designed by Rhine Pools? So, why should you choose a custom pool design by Rhine Pools? Let’s take a look! With a custom pool design by Rhine Pools, your already beautiful home will be perfectly accented. Let Rhine Pools help you become the highlight of your Ellicott City neighborhood with a custom pool design. Choose from an array of custom features for your backyard. Make your backyard a true outdoor living space with features like waterfalls for ambiance, a hot tub for relaxing summer evenings, and an outdoor kitchen for those wonderful summer cookouts. When working with a pool expert like Rhine Pools, you are not just working with a single designer. When you work with the team, you are working with a staff of three people who are experts in their field and will make sure to the job is done properly. Our team of a qualified landscaper, engineer, and a Maryland Registered Landscape Architect will make sure everything is done perfectly. With our team on the job, your custom pool design will work with your existing architecture and make your home stand out from the others. Rhine Pools understands how stressful any type of renovation project can be. But with the right time by your side, this process can be seamless. To help you get through the process, our team of professionals is here to help and to communicate with you from start to finish. Our on-staff architects will work to understand your needs and visions. If changes are necessary, we will help you work through the decisions that need to be made so you never feel like you are left in the dark about your home or your project. Let Rhine Pools give you the custom pool design you have always wanted for your Ellicott City home! Call Rhine Pools Today at 410-442-2445! 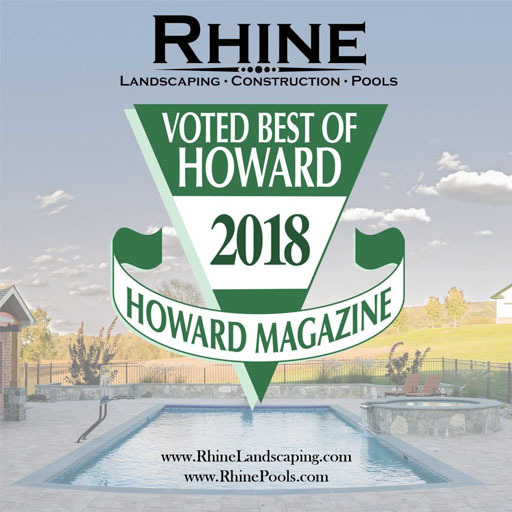 Over the years, Rhine Pools has built a reputation as one of Maryland’s premier pool builders. Whether you are looking for a new pool or a new hot tub, Rhine Pools is the company you should work with. To start building your backyard oasis, call Rhine Pools today at 410-442-2445.